Planning to correct the anatomical problems, add more detail and maybe more flowers, ink it and probably colour it. 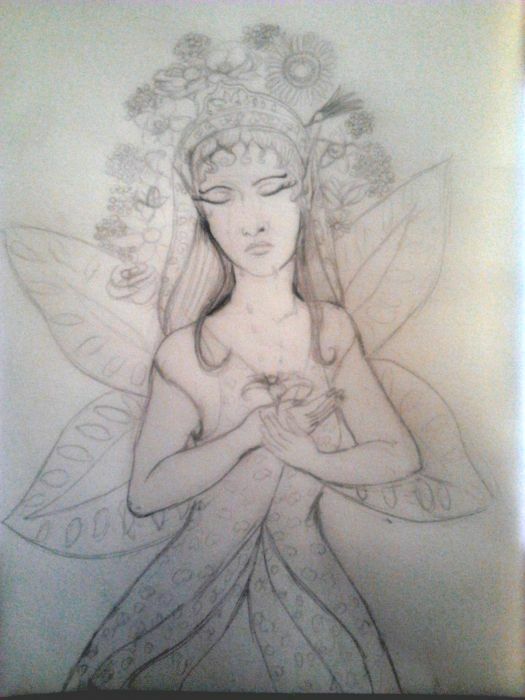 Again, is a bad quality photo :( When I have coloured it and have my scanner back I will submit the finished piece. Jo McQuillan says: Thank You very much for doing this wonderful sketch from my prompt, she's lovely and I thought had a touch of a Bodhisattva to her. :)	~ Reply? Irene Fernandez replied to this: Thnaks Jo, I am so glad you liked it :) I am definitely finishing and coloring this one.